Robotic surgery is a high technology minimally invasive system. Morgagni's hernia is a rare congenital diaphragmatic hernia subtype that occurs in relation to the sternum anteriorly. Classically, symptomatic Morgagni's hernia is repaired by open abdominal approaches to reduce the hernia contents and suture the defect primarily or by patching large defects with a synthetic mesh. Recently, authors advocate the use of laparoscopic surgical techniques to repair such hernias especially the elective ones. This case discusses Morgagni's hernia repair using robotic surgery. Robotic surgery is a high technology minimally invasive surgery system that emerged about the same time of laparoscopic procedures in the late 20th century. 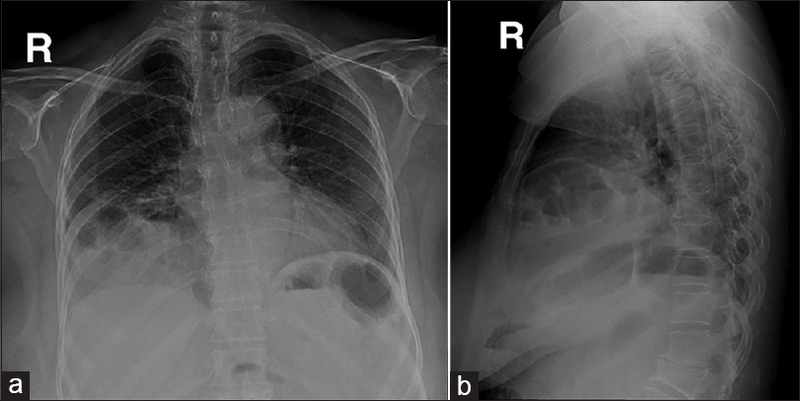 Congenital diaphragmatic hernia is an uncommon condition with the majority of cases present immediately after birth in association with respiratory distress. However, some cases may present later during adult life. There are three types of congenital diaphragmatic malformations; the first and most common is the Bochdalek type (posterolateral defect) accounting for more than 95% of cases that occurs on either side of the diaphragm but more commonly (80%–85%) on the left side; followed by Morgagni type (anterior defect) either retrosternal or parasternal occurring more on the right side of the chest; and diaphragmatic eventration due to incomplete muscularization that can be found unilaterally or bilaterally. According to cited literature in the English language, this is the second report that discusses robotic repair of a Morgagni hernia. The first report was published in 2016 reporting the successful application of closure and placement of bioabsorbable and biological mesh in three adult patients. A 50-year-old woman referred from a district hospital as a case of stable traumatic diaphragmatic hernia for laparoscopic repair. This patient sustained a motor vehicle accident 5 months before her presentation to the referring hospital complaining of worsening heartburn and dyspepsia that exist since 11 years. These symptoms were aggravated after meals and relieved somewhat with antiacids and H2-blockers. A chest roentgenogram revealed a right-sided diaphragmatic hernia [Figure 1]a and [Figure 1]b. The patient underwent robotic repair of what turned out to be a Morgagni's hernia rather than a traumatic diaphragmatic hernia using the da Vinci ® system [Figure 2]. After reducing its contents, the hernia defect was patched with GORE-TEX ® dual mesh [Figure 3]. Total operative time was 3 h and 38 min. The patient had an uneventful postoperative course. The patient was discharged on the 3rd postoperative day, seen after 1 month, 1 year, and 2 years follow-ups. She reported no significant complaints. The majority of Morgagni's hernias that are discovered during adulthood are asymptomatic or present with respiratory and/or gastrointestinal symptoms. In this case, preoperative preparations were adequate, retrospectively, however, a thoracoabdominal computed tomography would have been prudent to obtain to better locate the hernia's defect and plan the right approach. After discussing the various operative options, the patient was consented for robotic versus laparoscopic or open repair. The robotic repair was attempted in this case anticipating a large defect that requires a mesh. This approach was selected assuming that robotic repair and suturing techniques will be easier and more secure compared to the laparoscopic approach. The robotic picture indicated a diaphragmatic hernia with parts of the transverse colon, omentum, and stomach passing through a right parasternal Morgagni hernia defect, rather than a traumatic one, which is usually central. The contents of the hernia sac were reduced with difficulty into the abdominal cavity because of the high intra-abdominal pressure caused by the pneumoperitoneum and also the chronicity of the herniation. 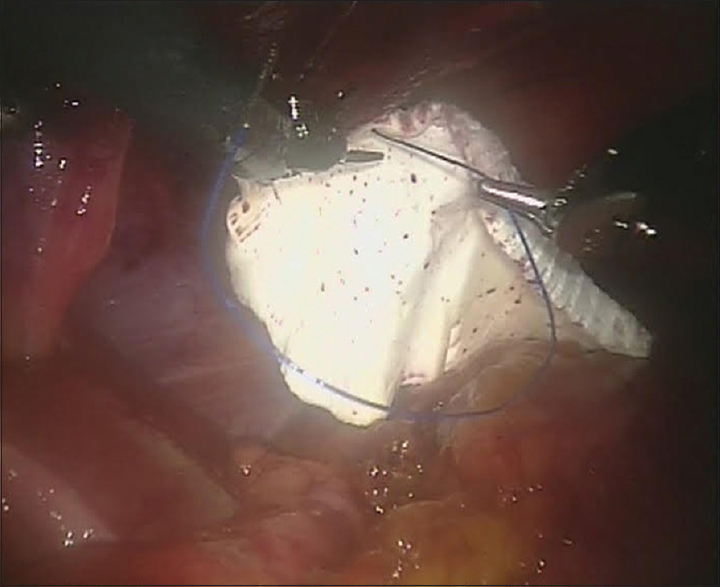 The success of reducing the contents of this Morgagni's hernia was greatly helped by the robot due to the three-dimensional vision and easy maneuverability that allowed for safe manipulation and reduction of the omentum, followed by the rest of the hernia sac contents. Another point of importance is the fact that we used a single-lumen endotracheal tube; a double lumen one may have been more useful for collapsing the right lung to allow an easier and safer passage of the hernia contents into the abdominal cavity. Similarly, bowel preparation or fleet enemas may have been of help in reducing colonic distention to minimize the risk of bowel perforation and its sequences during manipulation. Total operative time took 3 h and 38 min divided into anesthesia and robotic set up (51 min), and actual robotic surgery (2 h and 47 min). Conventionally, Morgagni's hernia has been managed surgically using open repairs. Currently, however, recommendations favor laparoscopic repair especially the elective ones., Minimally, invasive surgery has proved to be as effective as the conventional open one. It causes less postoperative pain and consequently makes for earlier convalescence. It has the added advantage of better cosmetic results and less wound-related complications., Nevertheless, there is an ongoing debate when it comes to which procedure is the preferred one, laparoscopic versus robotic. Laparoscopic surgery has some advantages over robotic procedures chief among them the fact that it is a well-developed technology, affordable, ubiquitous, and has an excellent track record. Laparoscopic surgery has some additional advantages that include availability, less expensive procedures, more flexibility within a cavity; and less time consuming when compared to robotic procedures. Proponents of the robotic approach cite the three-dimensional visibility, improved dexterity, maneuverability and suturing techniques, the ability for microanastomosis, elimination of the fulcrum effect and the physiologic tremors, ergonomic position, and the fast learning curve are some of the features that give the robot the necessary edge. Future development of the robotic technology may improve its complexity and makes it more feasible. Robotic attempt to repair this diaphragmatic hernia proved to be ideal as visibility and maneuverability of the hernia contents became easier, and there was a sense of confidence and precision during cutting and suturing the mesh along the edges of the defect. In spite of the fact that this experience was a success, more studies are needed to build a consensus on the matter. The author would like to thank prof. Mohammed Al-Naami for his help editing this manuscript. Gaxiola A, Varon J, Valladolid G. Congenital diaphragmatic hernia: An overview of the etiology and current management. Acta Paediatr 2009;98:621-7. Torfs CP, Curry CJ, Bateson TF, Honoré LH. A population-based study of congenital diaphragmatic hernia. Teratology 1992;46:555-65. Colakoglu O, Haciyanli M, Soytürk M, Colakoglu G, Simsek I. Morgagni hernia in an adult: Atypical presentation and diagnostic difficulties. Turk J Gastroenterol 2005;16:114-6. Thomas TV. Congenital eventration of the diaphragm. Ann Thorac Surg 1970;10:180-92. Arevalo G, Harris K, Sadiq A, Calin ML, Nasri B, Singh K. Repair of Morgagni hernia in adults with primary closure and mesh placement:First robotic experience. J Laparoendosc Adv Surg Tech A 2016;27:529-32. Loong TP, Kocher HM. Clinical presentation and operative repair of hernia of Morgagni. Postgrad Med J 2005;81:41-4. Nguyen T, Eubanks PJ, Nguyen D, Klein SR. The laparoscopic approach for repair of Morgagni hernias. JSLS 1998;2:85-8. Kelly MD. Laparoscopic repair of strangulated Morgagni hernia. World J Emerg Surg 2007;2:27. Darzi SA, Munz Y. The impact of minimally invasive surgical techniques. Annu Rev Med 2004;55:223-37. Marohn MR, Hanly EJ. Twenty-first century surgery using twenty-first century technology: Surgical robotics. Curr Surg 2004;61:466-73. Ballantyne GH. The pitfalls of laparoscopic surgery: Challenges for robotics and telerobotic surgery. Surg Laparosc Endosc Percutan Tech 2002;12:1-5. Lanfranco AR, Castellanos AE, Desai JP, Meyers WC. Robotic surgery: A current perspective. Ann Surg 2004;239:14-21. Morris B. Robotic surgery: Applications, limitations, and impact on surgical education. Med Gen Med 2005;7:72.